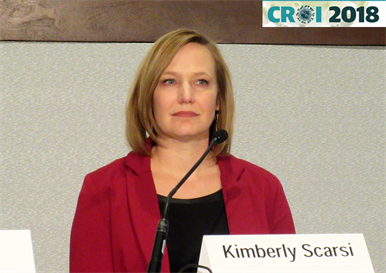 Kimberly Scarsi at CROI 2018. Photo by Liz Highleyman. The antiretroviral drug efavirenz significantly reduces the levels of both hormones in the vaginal ring contraceptive in women with HIV, Kimberly Scarsi of University of Nebraska Medical Center reported on Wednesday at the Conference on Retroviruses and Opportunistic Infections (CROI 2018) in Boston. Atazanavir also affected levels of the hormones, but its effect appeared less likely to undermine the contraceptive effectiveness of the vaginal ring, the study showed. “If I was a woman receiving an efavirenz-based antiretroviral regimen I would be uncomfortable with the degree of contraceptive protection I would be getting from the vaginal ring,” Kimberly Scarsi told a press briefing following the presentation. The vaginal ring (NuvaRing) is a flexible plastic ring containing 120 mcg of a type of progestin called etonogestrel and 15 mcg of ethinyl estradiol. The ring contains enough of the hormones to provide contraception for one month. Efavirenz is known to reduce levels of etonogestrel released by subdermal contraceptive implants but its effect on etonogestrel released by the vaginal ring is unknown. The boosted protease inhibitor lopinavir/ritonavir increases etonogestrel levels but the effect of other boosted protease inhibitors is unknown. To answer these questions, the AIDS Clinical Trials Group designed the A5316 study. The study recruited a control group of 27 women with HIV not yet taking antiretroviral therapy, 28 women taking efavirenz and 29 women taking atazanavir/ritonavir as part of a three-drug regimen. All women consented to use the vaginal ring with another form of non-hormonal contraception. All women on antiretroviral therapy had viral load below 400 copies/ml. The control group had a median age of 31 years and the antiretroviral treatment groups a median age of 36 years. Participants were predominantly black (44-64%) or Hispanic (32-40%). Participants underwent pharmacokinetic assessments of plasma concentrations of etonogestrel and ethinyl estradiol on the day they commenced using the vaginal ring, day 7, day 14 and day 21. Levels of ethinyl estradiol, the oestrogen component of the vaginal ring hormonal contraceptive that suppresses ovulation, were reduced by 53-57% in the efavirenz group compared to the control group and suppression was evident within seven days of first insertion and throughout the sampling period (p < 0.001 for all measurements). Ethinyl estradiol levels were reduced by 29-35% in the atazanavir/ritonavir group, and this difference was significant compared to the control group at days 14 and 21 (p = 0.032, p = 0.004). Levels of etonogestrel, the progestin component of vaginal ring contraceptive that suppresses ovulation and impedes fertilisation, were reduced by 76-79% in the efavirenz group, but increased by 71-79% in the atazanavir/ritonavir group (all p < 0.001). Menstrual bleeding abnormalities were more frequent in the efavirenz group but other adverse events were more common in the control group. The researchers concluded that efavirenz-based antiretroviral therapy may decrease the effectiveness of vaginal ring contraceptives and warned that combination antiretroviral-hormonal contraceptive vaginal rings for HIV prevention could also be affected by drug-drug interactions. Scarsi K et al. Vaginal contraceptive hormone exposure profoundly altered by EFV- and ATV/r-based ART. 25th Conference on Retroviruses and Opportunistic Infections (CROI 2018), Boston, abstract 141, 2018.